Natural Alpha-Bisabolol is obtained by distillation from the candeia tree. 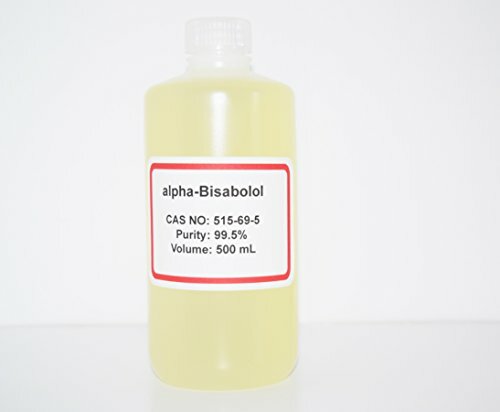 Alpha-Bisabolol itself is a clear, colorless to slightly yellowish liquid, with a faint, floral, sweetish odor. Our Alpha-Bisabolol is a 100% plant extract and it contains 99.5% of (-) Alpha-Bisabolol. This is the highest purity on the market so far. It is NOT synthetic. Bisabolol can also be made by chemical synthesis. The synthetic Alpha Bisabolol contains only about 85% pure Bisabolol and is a racemic mixture of both levorotary and dextrorotary isomers. Thus, on an activity scale, our natural Alpha-Bisabolol is about 2.3 times more potent than synthetic material. Applications: It is very compatible with usual cosmetic raw materials. For hundreds of years, people have used it for medicinal practices, believing it to have anti-irritant, anti-inflammatory and anti-microbial properties. Because of its high panthenol concentration, it can effectively stimulate and promote the skin's healing process and encourage healthy hair growth. It is a super excellent ingredient to soothe irritated skin. It enhances the appearance of dehydrated or damaged skin by reducing dry flaking and restoring suppleness to the skin. In addition, it also increases the skin penetration of other cosmetic ingredients, which can be particularly useful when feeding the skin antioxidants. In addition to its skin soothing and healing abilities, it also exudes a subtle floral aroma that is often used to add fragrance to cosmetic products. You can find this ingredient in a wide variety of personal care products such as moisturizer, sunscreen, anti-aging treatment, eye cream, mineral powder foundation, cleanser and lipstick. Recommend dose: 0.1%-1%. Return Terms: We accept return if the original package is unopened. If you have any questions about this product by L'eternel World, contact us by completing and submitting the form below. If you are looking for a specif part number, please include it with your message. Potassium Carbonate "K2CO3" Minimum 99% purity! 50LB BAG!